Because polynomial functions do not have domain restrictions, the limit can be found by plugging in c such that the limit of f(x) as x approaches c is f(c). For example, the limit of the function f(x) = x^2 + 2x + 1 as x​ approaches 1 is f(1) = 1^2 + 2(1) + 1 = 4. 1) Type in the word "lim" using the qwerty keyboard. Activate it by tapping the a-z​ button. 2) Tap the exponent key four times. 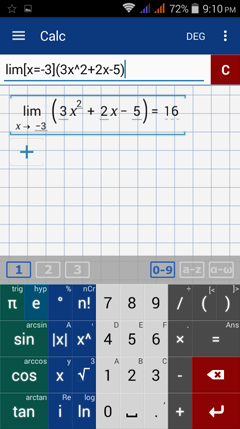 3) Tap and hold the exponent key and select "lim." Enter the value being approached using the format: [ x = c ]. Use c+ and c- to find the right- and left-hand limits respectively. Make sure to include the brackets. Then type in the function. Use parentheses if it is longer than one term.